Slow down. 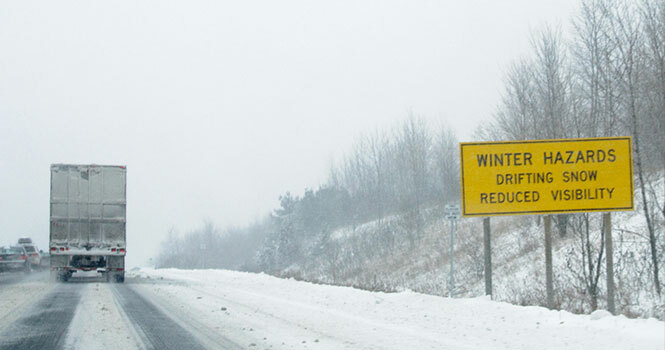 Winter driving conditions can be slippery at best and treacherous at worst. Be prepared. Don’t wait until a snowstorm hits to have your snow tires installed for the season. Keep a tire pressure gauge in your car. They’re inexpensive, simple and compact. Check your tires’ inflation once a month and before long road trips. (Don’t forget to check the spare tire too.) The vehicle manufacturer's recommended inflation pressure is listed on a label on the driver's door frame or rear side of the driver door and in your owner's manual. Be warned, the correct pressure is not the number that appears on the sidewall of the tire. Also, check the tire pressure when the tires are “cold,” meaning the car has not been driven for at least three hours. Watch the weather. As the mercury drops, so does your tire pressure. Tire pressure decreases about one psi for every 10ºF the outside air temperature drops. Monitor your tire wear. If your tires don’t have at least 2/32” of tread depth, or if the tire is wearing unevenly, it’s time to replace them—especially if you live in an area that gets snow, rain or slush. Adequate tread depth is critical to maintaining traction and control. Invest in snow tires. In general, they will provide much better performance in heavy snow and slick, icy road conditions than even “good” all-season tires.